« Nostradamus Predicts McCain win? NOT! I got this great CGI political cartoon from Johnny Anonymous who hosts the ATSmix with Dave Rabbit. I enjoy doing radio pod casts with them. They are very funny, witty guys. Together we invoke the fond memory of Sebastian Cabot (the late British Actor, and my look-alike) to have some in-depth yet serious fun with doomsday. I mean, if you can’t laugh at doomsday, what can you laugh at? What that “Change” is, only the mighty and all-powerful Wizard of Oz knows. Obama courted the American people with his full court press of promises. He will be our hubbie-in-chief and no tapping of ruby Republican red slippers three times, reciting “There’s no place like home — there’s no president like Reagan — will bring the farm house down to that black and white political world again. So, I suggest you celebrate the history changing Election Night cuddling with your favorite Munchkin, winged Chimpanzee, naughty witch, tin man, dancing scarecrow or cowardly lion by listening to George Noory’s special Coast to Coast AM show starting 9 p.m. Pacific, tonight (Election Night). 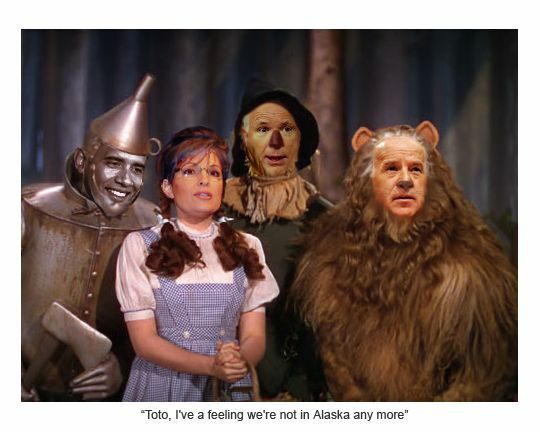 I don’t yet know when I’ll be on, or whether Ron Paul will join us, but it will be a Wizard of Oz hoot for sure. You can bet your burnt witch’s broom on it, Wiz. 4.) If this election is disputed, the hubris of Obama is responsible. If Clinton had been his running mate it wouldn’t even be close. Read this carefully. If there is one iota of potential remaining that Obama could even LOSE this election, it will come from his bad political choice in running mates. He needed a centrist to win big, not someone like Senator Joe Biden, who is nearly as left leaning as himself. Biden might make a good Vice President (he may even “become” president) but first things first. You have to win the election. 10.) After Election night the Democratic Party will be standing naked. It will no longer be able to pretend it can’t act because it is clothed in a Republican straight jacket made of the fabric of Senate filibuster or the confining corset of a Republican president’s veto power. The Democratic Party elect will no longer hide their warts, cellulite flab and hypocrisies under a cloak of excuses. The American people will vote them the Executive Branch and both houses to do the people’s business unimpeded. Do not take this as a mandate to take American government out of the frying pan of one ideological extreme into the fire of another — from Right Wing extremism to Left. If ever a Prez he was. Because, because, because, because, becaaaause! Because of the Wonder of Change we Buzz. Dah-dittily, dittily doo! Dee dum! We’re off to see Obama! The wonderful Wizard of US!! This entry was posted in Election 2008, Geo Politics and tagged CoasttocoastAM, Election, Hogue, McCain, Nostradamus, Obama, prediction, President. Bookmark the permalink. Post a comment or leave a trackback: Trackback URL.